This is a huge day for us Pokemon Go fans. Niantic reveled this morning that after two years we will be finally getting a trading feature, one that was teased and announced at launch. This trading feature will give us the ability to get region exclusive Pokemon that some people can not get otherwise. Each player will have their own Trainer Code that they can share with friends to exchange friend requests. Once someone has accepted your friend request, that player will appear on your Friends List, where you can interact in various ways. You will be able to add your friends and by playing with your friends you will be able to gain one of four friendship levels.The more you play the more bonuses you gain and the more perks you get for playing. 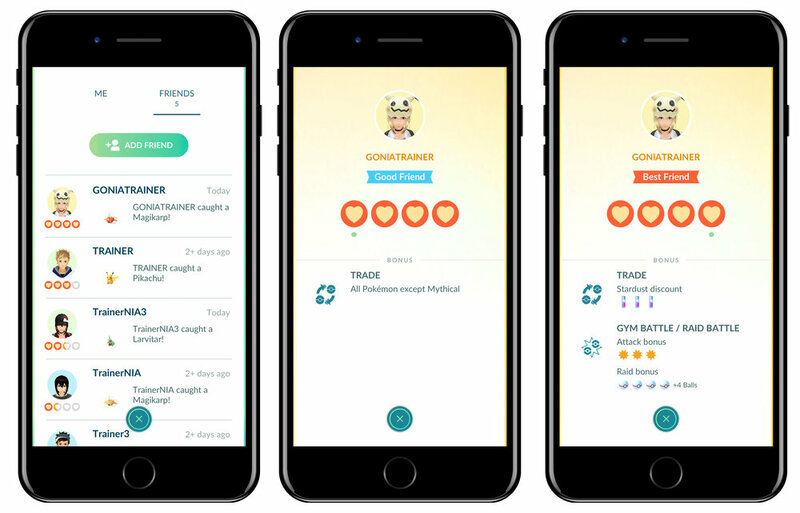 Sending gifts to your friends, trading, participating in Gym Battles or raid battles will increase your friendship level. There is a current cap of 200 friends you can have which may be changing in the future depending on how the system changes over time. You can only trade with people on your friends list, and only if you're within 100 meters of one another. You only have to be Level 10 to initiate trades with friends. Every Trade in Pokemon Go will require Stardust and depending on the kind of trade rather it is a regular Pokemon trade, region exclusive, special, or mythical trade the Stardust cost will change. For Example, 100 Stardust for Pikachu for a Squirtle and up to 1,000,000 Stardust for mythical Pokemon like Mew or Mewtwo. PokeStops will now occasionally drop Gifts, which you can send to friends on your list. Gifts will include a “postcard” from the PokeStop where you picked up the gift, as well as a rare item. Koa clarified that these items include rarer items within the normal PokeStop pool (hyper potions, revives, etc.) and not raid and research-exclusive items like Rare Candy or TMs. Finally Niantic teased more changes like new music and more social features. but those will be announced later this year. The product manager Kento Suga said that they want to make Pokemon Go the "Most social game in the world." All these new changes and additives are making Pokemon Go more a relevant and playable game. With so many new players and older players returning to Pokemon Go its starting to gear up to be an amazing summer and onward to Catch Them All!